This post is dedicated to Buddy, who is constantly in my thoughts. It is no coincidence that my first two posts in the 19th century have both centered on military themes. During the first half of the 1800’s in Stockholm, the economy was extremely strained and very little was built. The economy was so bad and the death rate so high that Stockholm’s population actually decreased almost 30% during the first decade of the 19th century, down from 90,000 to 65,000. The combination of the stagnant economy and the decreasing population meant that many years, fewer than ten new buildings were constructed in the entire city. The majority of these new projects were financed by the government, and the majority of government projects were for the burgeoning military. Sweden’s economic stagnation was largely due to the unstable political situation at the end of the18th century; After Haga Park's creator Gustav III was assassinated, the country didn’t really recover a sense of stability for several decades. Gustav III’s son Gustav IV Adolf began his career as king more or less as a puppet of the nobility, but he is most notorious for losing Finland to Russia during the Napoleonic Wars (ironic since both Sweden and Russia fought against France!). After this loss, effectively halving Sweden’s empire, Gustav IV Adolf was dethroned in a military coup. Gustav III’s brother Karl XIII was then handed the throne, but he was also a puppet king from the very beginning. Karl XIII was elderly, tired, powerless, and childless. During his short reign, Sweden managed to annex Norway in a forced union as reparation for the loss of Finland, but Karl XIII had very little involvement in that deal. Because he didn’t have any successors, Karl XIII was forced to adopt the Danish Prince Kristian August, but the prince died of a stroke in suspicious circumstances the same year. In another twist of irony, an ambassador was then sent to France to ask Napoleon’s opinion about who should be given the throne next, but the ambassador sold the crown to one of Napoleon’s army field marshals, Jean Baptiste Bernadotte. Bernadotte more or less acted as King from his adoption in 1810, but he wasn’t crowned as King Karl XIV Johan until after his adoptive father’s death 1818. The Bernadotte line is still Sweden’s royal family today. As Bernadotte was from a family of lawyers and didn’t have a drop of royal or even noble blood, I am dumfounded that Sweden accepted such a random candidate as its leader and king. While the ambassador didn’t exactly follow instructions, the choice of a successful army officer for Sweden’s king was not arbitrary. Sweden was tired of losing its empire piece by piece over the last century, and Norway was proving to be rebellious and hard to hold on to. Bernadotte was a tried and true commander and he understood mainland European politics. Although King Karl XIV Johan dedicated a lot of energy and money on building up and modernizing Sweden’s military, his politics focused on avoiding conflict. By the time that King Karl XIV Johan died around the middle of the century, Stockholm’s economy had picked up, largely due to a rapid and intense industrialization process. Stockholm’s population grew to 100,000 people by 1856, and suddenly there was a housing shortage which resulted in an extreme building boom. The country’s rapid economic growth filled the government’s coffers, and more and more money was spent on public projects. While many military buildings were still being built in the late 1800’s, public funds started to finance other types of large and complex projects such as schools and hospitals. Sweden’s loss of empire and its subsequent choice of a military-focused king who spearheaded military expansion and modernization is the framework against which many of the buildings below were built. Despite Sweden’s recent history of military failures, King Karl XIV Johan didn’t totally upheave the entire system; perhaps he realized that the treasury would never be able to finance a fresh start. Instead, Bernadotte built upon what was already in place. Stockholm had had a strong naval presence in the city since the 1600’s, especially on the islands of Skeppsholmen, Djurgården (shipbuilding), and Kastellholmen. New naval buildings in the 1800’s were all constructed on these islands. Similarly, Stockholm’s army presence had been centered around Gärdet since the mid-1600’s, and new army buildings were almost without exception built in a ring around these parade fields. Economic stagnation meant that there wasn’t a lot of money for extravagant military buildings during the first half of the 19th century. The architectural focus was more on function than on style and ornamentation, but the military buildings from this period are still well-built and elegant. The Gustavian Empire Style from the turn of the 19th century evolved into a more stringent Neo-Classicism with little to no extra details. These unornamented projects from the beginning of the 1800’s are in stark contrast to the military projects from the last half of the century. By that time, Sweden’s economic situation had turned completely, and building budgets allowed for more decoration than was strictly necessary. Architectural taste had also changed, and instead of a stripped down Neo-Classicism, architects began to favor a smörgåsbord of styles like Neo Gothic and Venetian Renaissance during the Victorian Era. 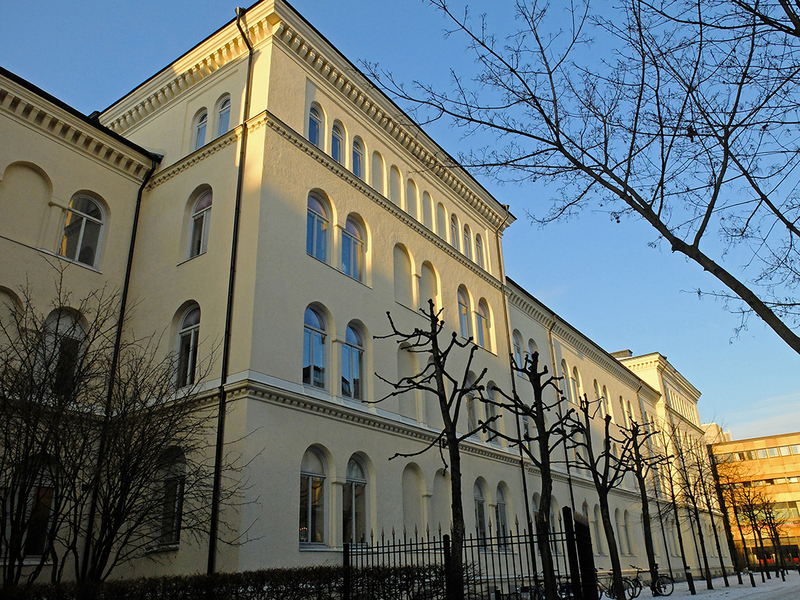 National Romanticism also flavored many of Stockholm’s neighborhoods and landmark buildings, and military buildings from the latter half of the 19th century tend to be stylistically “medieval military” with prominent but functionless towers, icing-like crenellation, and narrow slit windows. As I mentioned in my post about Kastellholmen, this nostalgia for the medieval military look was a bit ironic since Sweden had been too poor in the middle ages to support this type of fairytale defense castle; Sweden's castles were solidly built but not ornate in the slightest. I mention this building now because I haven’t had cause to in a previous post. It was built in the 1500’s and expanded several times over the centuries. This bakery provided daily bread and stored food for the military troops within range of the city all the way until 1958. Today it is the Music and Theater Museum. 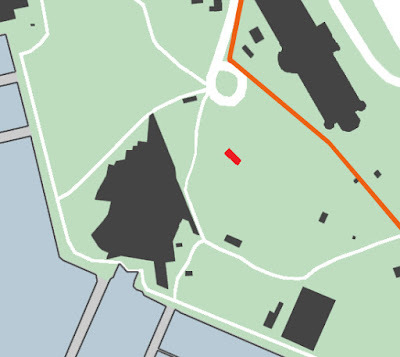 I have covered the parade grounds just outside of central Stockholm in greater detail in my post here. One of my sources says this building was constructed in the late 1600’s, another the 1700’s, and another the 1820’s. Due to its small size, heft of construction, and lack of ornamentation, I am guessing that this building was built earlier rather than later. Situated at the water’s edge, the Gunpowder House was used as a storage facility for gunpowder arriving by ship. While this area of Norra Djurgården is a forested park and sailboat harbor today, it was once a part of the larger Gärdet military area and was close to the military shooting range—a perfectly logical location for a gunpowder storage facility. Today the building is a cozy café. 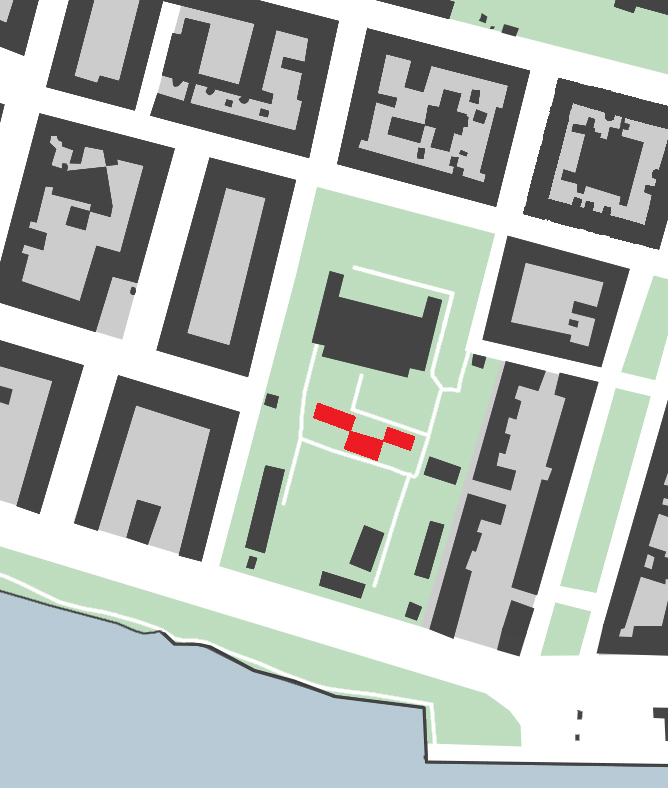 Built on the Gärdet Parade Ground, this jumbled storage facility was composed of a number of different buildings built from 1717 through the 1800’s. Most of these buildings were demolished in the 1960’s when the gigantic TV House was built, but three of the historic buildings (Kruktkällaren from 1717, Stora Stenskjulet 1750’s, and Karl Johan förråd from the beginning of the 1800’s) were integrated into the grounds. The public is not allowed to enter the TV House grounds, so I was forced to photograph from afar. 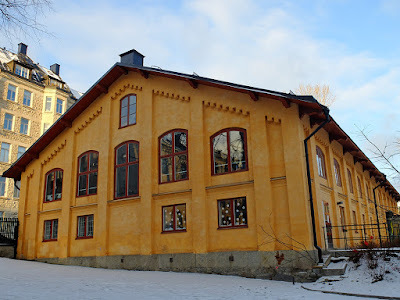 I believe that this building is the Stora Stenskjulet. 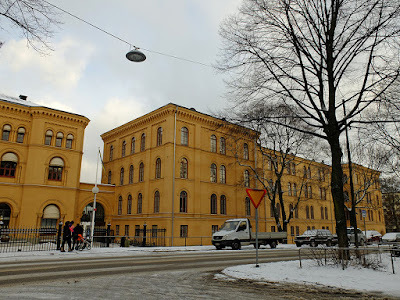 I usually don’t write much about buildings which have been demolished, but the College for Artillery Officers at Marieberg on Kungsholmen became significant in Stockholm’s current urban context because it was a large block of land which was exclusively held and developed by the military until the 1960’s. At that point, the entire complex of 50+ buildings was demolished and the land used to build two of Stockholm’s largest buildings for the Svenska Dagbladet and the Dagens Nyheter newspapers. 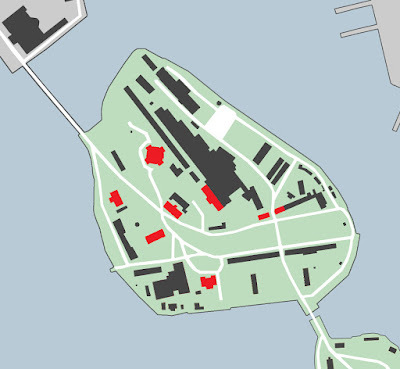 This military campus effectively became Sweden’s press center. 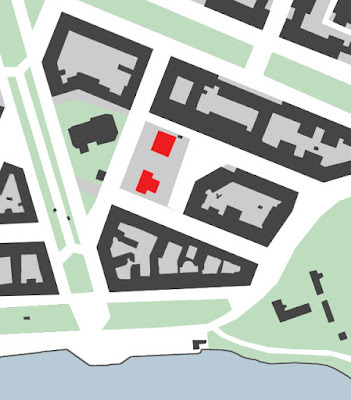 Additionally, some of Stockholm’s less attractive housing was built in the area. All of the above buildings were already in use before the 19th century, but very few of them were purpose-built. Cronstedt’s Artillery complex was Stockholm’s first impressive, purpose-built military complex, and it was built at the edge of what was then the Gärdet Military Parade Ground (today Gärdet is several blocks away). This complex was built for the army’s artillery corps as a weapons workshop, smithy, and storage facility. 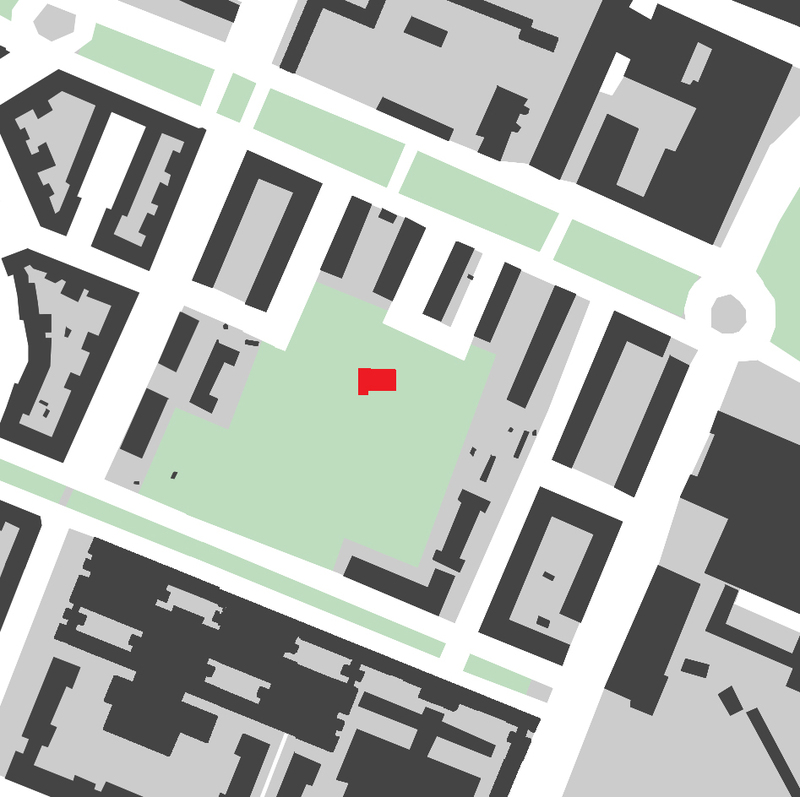 The site had been used for the purpose since 1641, and the original wooden buildings were laid out around a huge central courtyard, much like a contemporary palace. The original wooden buildings were replaced by sturdier brick buildings in the mid 1700’s, but the layout around the central courtyard remained the same. Verrrry long wings wrap the huge courtyard and edge the street on three sides of the complex. The white-plastered buildings are fairly simple but not completely without decoration, and they are certainly not lacking symbolism. The facade is nominally rusticated with slight incisions into the plaster, slight temple-fronted protrusions mark the building entries and provide a bit of three-dimensional relief and shadow play, huge arched windows allowed daylight into the storage spaces, arched colonnades provide a bit of shelter near the street, and lions, javelins, and cannons in the tympanums proclaim Sweden’s might. Sturdy arched ramps provided a way to roll heavy cannons up to the second floor. Ever since my first visit to the complex, I have been intrigued by the trapezoid-shaped protrusions at the end pavilions. 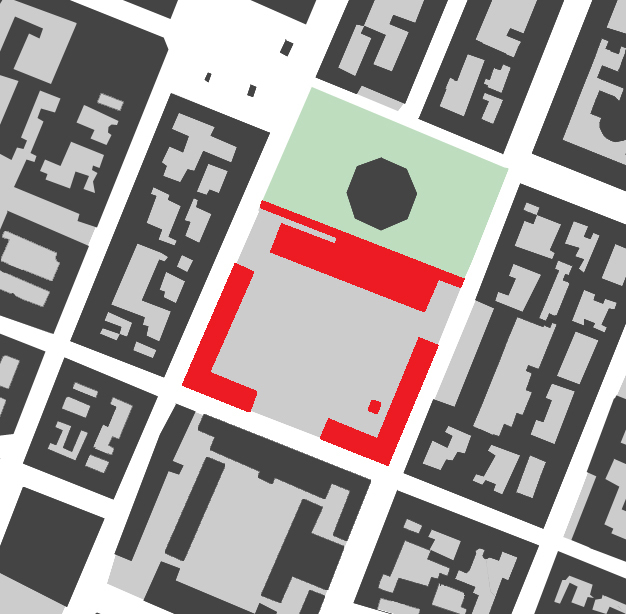 Traditionally, trapezoids have been used in Western architecture as a reference to Egypt. These trapezoids are almost exclusively used as an ornamental element in medical architecture, as the 18th and 19th century medical profession admired the ancient Egyptians’ medical knowledge and skills. I have been puzzled to this potential medical reference until I flipped through my photos of the complex a couple months after photographing it. Suddenly, I realized that instead of a vague reference to medicine and Egypt, this trapezoid is actually the base of an artillery shell! Historically, the large courtyard was used for cavalry training. While the courtyard is mostly enclosed by the main building and the wings, it can be completely closed off from the street by a military-themed cast iron fence. The complex was converted into an military college with artillery and engineering as the main disciplines in 1882. 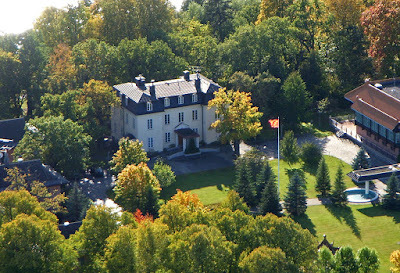 Since 1932, the complex has primarily been used as a military museum. I wrote more about the Copper Tents in my post about Haga Park, but these “Roman field tents” were built to house the King’s guard while he was living at the countryside Haga Palace. This Palace was originally built as a private palace in the 1630’s, but Gustav III donated the building to the Royal Military Academy in 1792. Its very long wings were added in 1795 to house the cadets. The building still houses the War College and the grounds are a lovely public park. I have posted more about the building here. This building was originally part of Graver’s Malmgård (see #17 in my post Malmgårdar of the 1700's) on the island of Kungsholmen. It was bought by the crown in 1788 and used from 1793-1811 as a barracks for the Calvary Guard. When the Calvary Guard moved into their new, purpose built complex (see #13 below), it was converted into an army hospital. 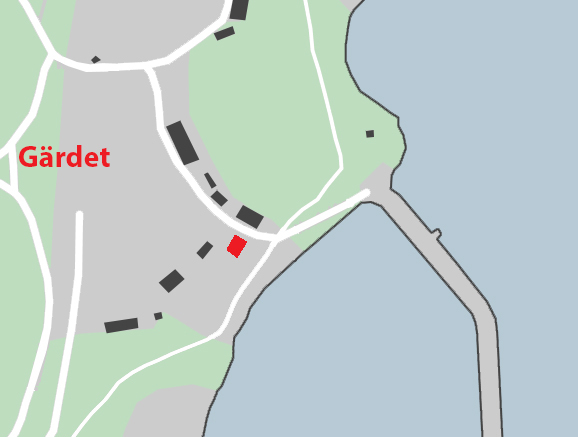 This building was also originally a palace residence, but as it was conveniently located on the edge of the Gärdet Parade Ground, it was used by the military from 1802-1882 as barracks for the Svea Livgarde, or the Crown’s Guard. The Guard moved to a new purpose-built building in 1882, see #22 below. Sadly, only two small buildings remain from what was once a large and pompous palace; today these remainders are used as a school. For more information, see #2 in my post Palaces of the 1700's. In the light of the American and the French revolutions and of Sweden’s own unstable monarchy, Sweden began to ease the burden of the housing of troops off the shoulders of private citizens in the beginning of the 1800’s. 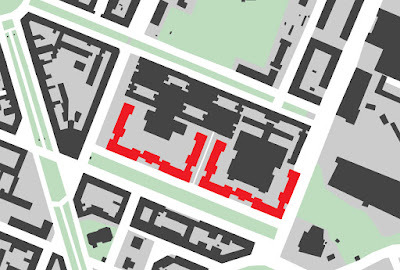 In the new system, the government paid for housing and board for larger groups of troops. 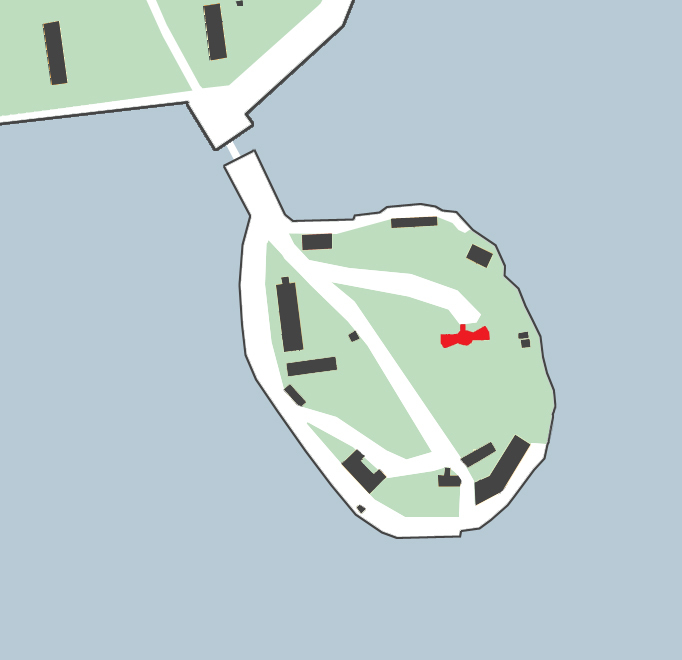 This barracks, along with #10 Fredrikshov’s Palace above and #12 Southern Barracks below, is one of the first examples of the new federally funded system for housing of troops. This building was used as a barracks until 1888. Like the Barracks in #11 above, this building was not purpose-built for the military; the building was bought by the army in 1813 to house troops. 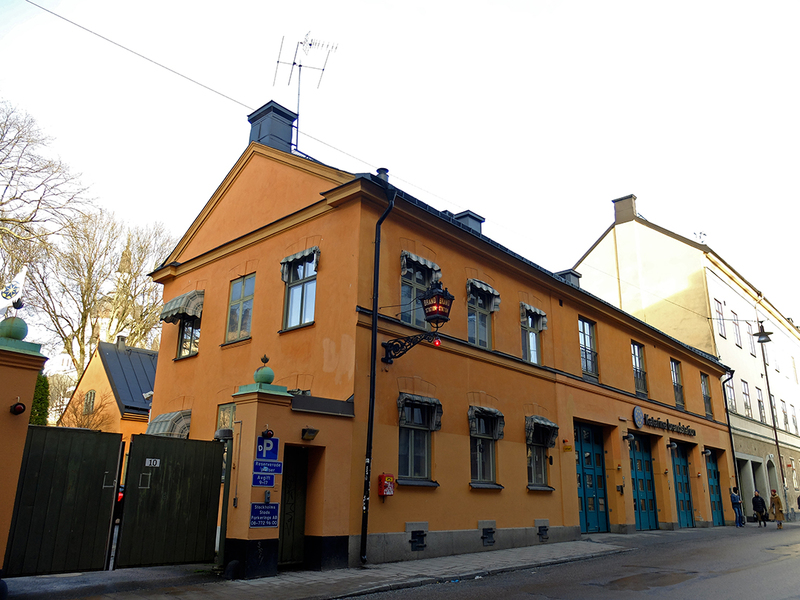 It was used until about 1850 when it was converted into a fire station and it is still a fire station today. The stables out back have since been converted into housing. Another large military complex was built a few blocks from the Artillery Yard, this time to house the Calvary. 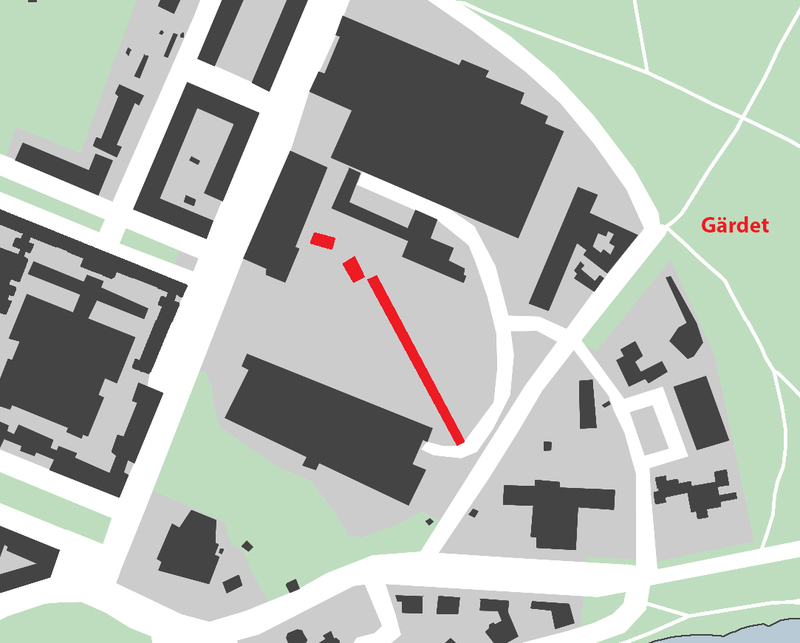 It is not insignificant that the Calvary Guard complex was built on the edge of Gärdet, Stockholm’s military parade and exercise field. The Calvary Guard complex was built before Östermalm was heavily developed. At the time, the area was occupied by small cottages with gardens and the occasional more impressive malmgård or suburban summer house/farm. The Calvary Guard complex was built on part of the Oxenstiern Malmgård (see #9 in my post Malmårdar of the 1700's) which was originally built in the early 1700’s. In comparison to the surrounding small cottages and malmgårdar, the Calvary Guard buildings, which were situated on top of a little hill, dominated the neighborhood. Blom’s Calvary Guard buildings (red on the map above) are spare and simple, an expression of the time’s necessary frugality and of the idea that buildings built with a public budget shouldn’t be unnecessarily ostentatious. Simultaneously, however, Blom’s buildings are impressive and stately. The main building’s contextually overscaled bulk and the fact that the complex sits on top of the rise reinforce the imposing impression made by the dark, rusticated base and the almost severe plastered facade. 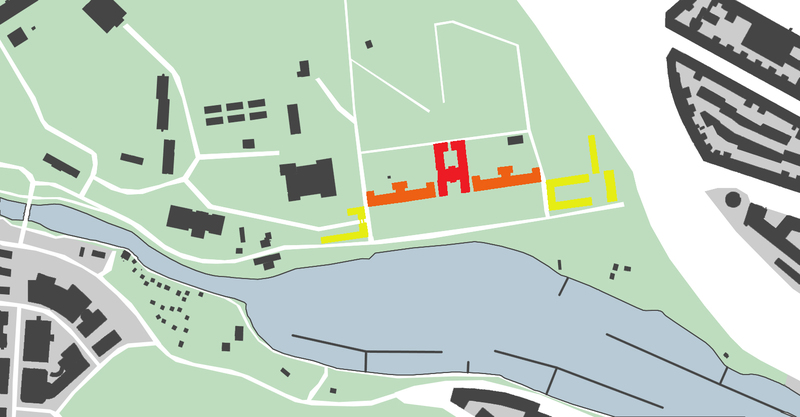 The forecourt is partially bounded by two substantial horse stables and the main building, which housed the guards, is centered on the opening between the two stables. The forecourt sits almost a full story above the adjoining street, making the complex feel even more stately and inaccessible. A steep cobbled drive connects the street to the forecourt. 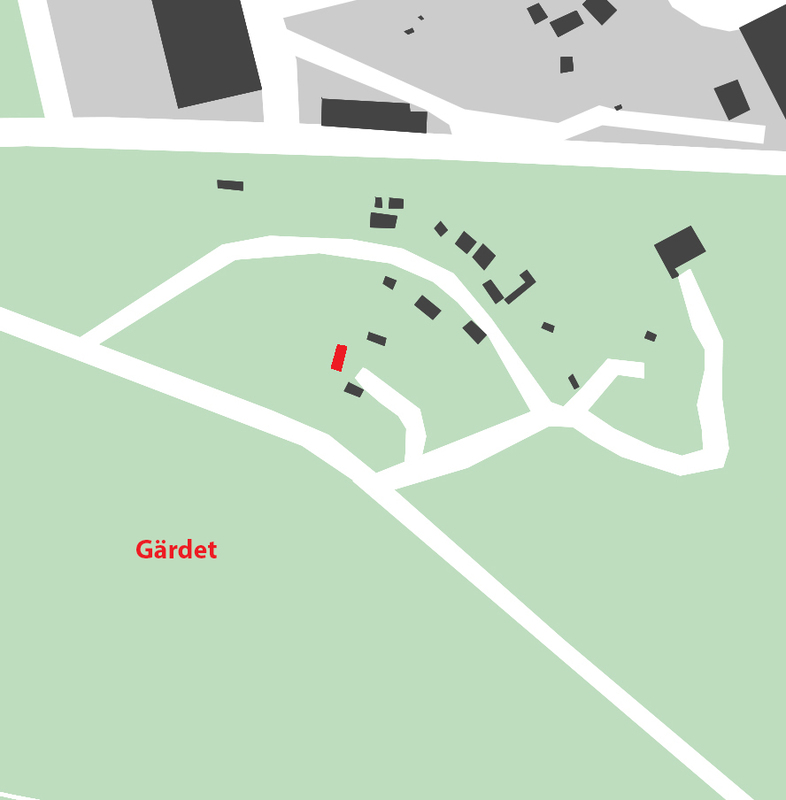 A bit later in the century, a riding school and an “exercise” house were built beside the Calvary Guard complex, taking up more of Oxenstiern Malmgård’s land. 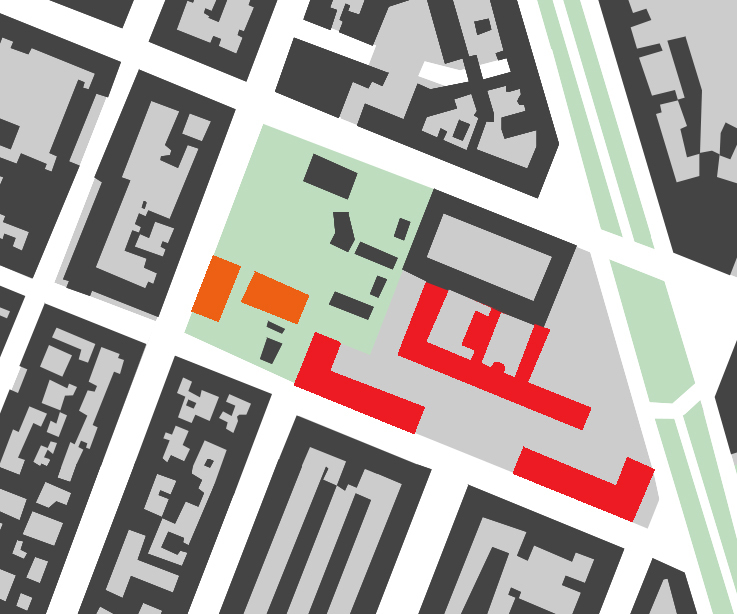 These buildings are orange on the map above. This complex since been converted to a multitude of uses including a library and archive, offices (including offices for the Swedish Society of Architects), a preschool, and more. While not an impressive fortress per se, this little building is a good example of the Gustavian Empire Style. It was built as a comfortable “camp” where the King could observe the military exercises on the Gärdet field below. 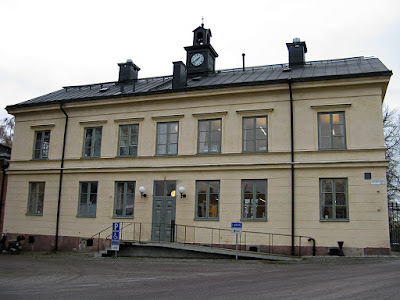 I wrote more about the building in my post about Gärdet. The Garrison Hospital was the largest building project during King Karl XIV Johan’s reign (the Göta Canal was his largest construction project). Designed by Gjörwell and built on the grounds of Graver’s Malmgård (see #9 above), this hospital sat on a rise, overlooking the Malmgård buildings to the water beyond. 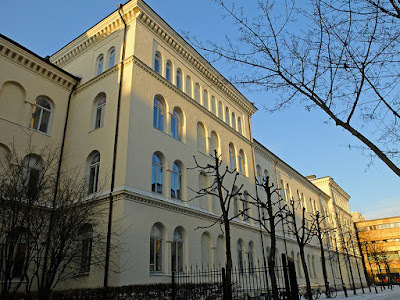 This hospital is Stockholm’s grandest Neo Classical building with a raised piano noble, a temple facade with robust Doric pilasters, smooth plaster facades with minimal ornamentation, and a deemphasized roofline. It had a capacity of 600 patients and also served as a training hospital for military medical personnel. The building was used as a hospital until the 1970’s when it was turned into offices for Stockholm County. The building yields no clues as to its use—it could just as easily be a government building or a palace—but the cast iron fence surrounding it reveals both its military and its medical nature. This wall was built around the entire land side of Gälarvarvet, or The Galley Shipyard on the island of Djurgården in order to protect the navy’s shipyard from fire. It was designed by Blom, but its Neo-Gothic, National Romantic “military defense” style with crenellation details and a pointed-arch gate is in sharp contrast to Blom’s earlier severe and unornamented Calvary Guard complex (see #13 above). I can't help but think that the design of this shipyard wall must also have been influenced by the wall around Venice's Arsenale, long fabled as the world's best and most secretive shipyard. Blom’s design called for the wall to be plastered, but the brick was never covered over for budget reasons. While exposed brick had never been in style in Stockholm’s past, it became increasingly popular as a “historically true” material in the latter half of the 19th century. 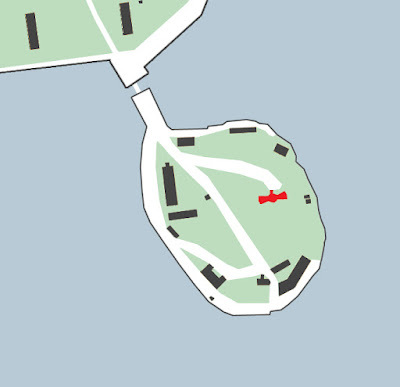 Blom’s Guard House sits on top of a hill in the middle of what was once Gälarvarvet, or The Galley Shipyard. The Guard House, with its exposed brick, plaster crenellation details, tower, and pointed arched window openings, is in keeping with Blom’s earlier fire wall which surrounded the shipyard. Today, the building is an enviable private residence. Skeppsholmsyrkan, Skeppsholm’s Church, 1824-1842. Architect Fredrik Blom. Although stylistically similar to his fire wall and guard house at the Galley Shipyard (see #16 and #17 above), Blom’s small Castle is much more prominent in Stockholm’s skyline and more symbolic in the city’s history. 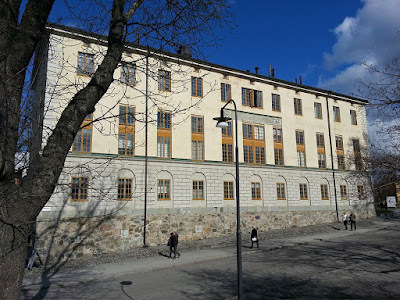 I have written about the Castle in more detail in my post about Kastellholmen. 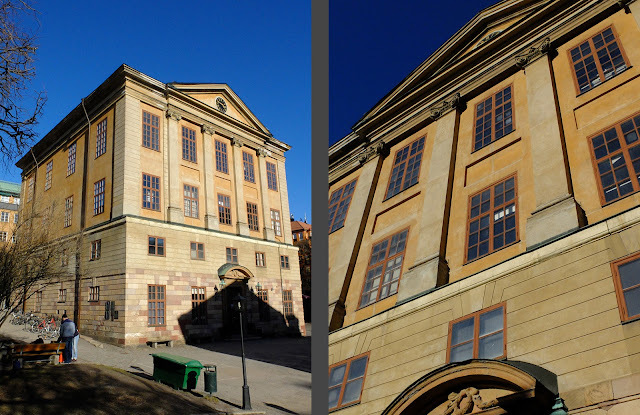 With its crenellation-inspired cornices, Ernst Jacobsson’s large complex for the Swedish Artillery Regiment is stylistically similar to Fredrik Blom’s later buildings. However, instead of a medieval gothic slant, Jacobsson used more of a Renaissance Venetian theme with rounded arched windows framed by thin pilasters. 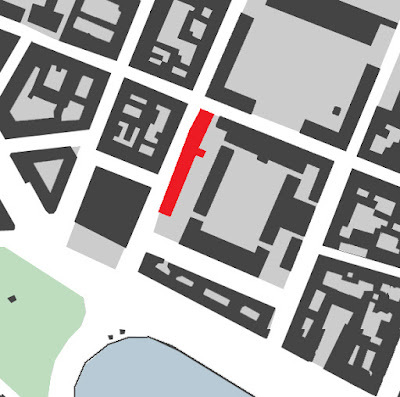 Watercourses clearly delineate every floor, and the facade juts significantly out to break up the two-block-long building. The eastern half of the building. These buildings are located on what was the edge of Gärdet, Stockholm’s military parade ground. Today, the buildings are used for offices for various companies. 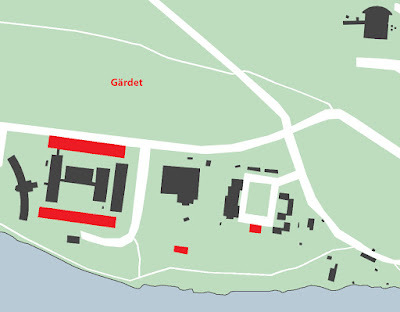 Jacobsson designed another large complex at the edge of Gärdet, this time for the Dragoon Corps. (Dragoons were a type of calvary.) 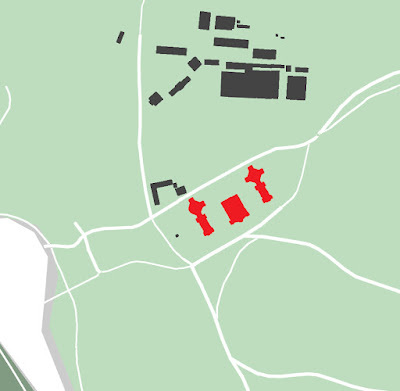 The complex included several large barracks, but most of these have been demolished. 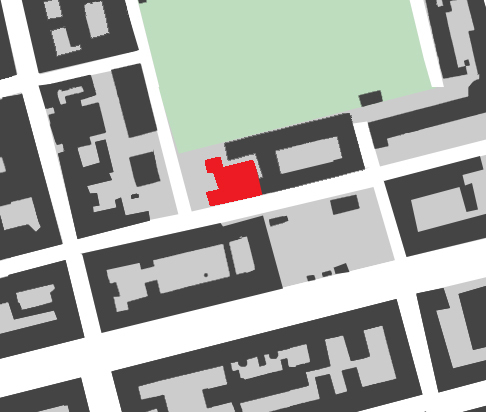 Only the officers' barrack survives today, and it is now incorporated into the Chinese Embassy complex which is completely hidden by a fence. Also surviving are two long horse stables which housed a total of 300 horses as well as a smithy and a kitchen building. I am not sure which is the kitchen and which is the smithy, but one of these buildings is comparatively ornamental with rustication incised into the yellow plaster. The horse stables are almost completely without decoration, but they are punctuated by lift beams which helped to move hay up into the hay loft. Stable on left, kitchen or smithy on right. 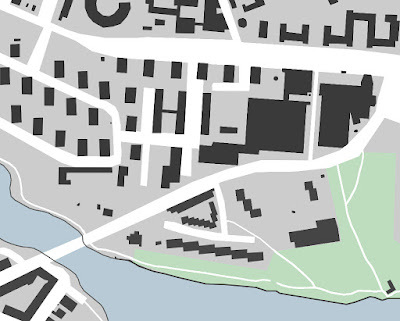 Even though the army had begun to house troops together in military-provided barracks instead of quartering them with private citizens, the barracks were spread out over the city and too small to house any large number of troops. Toward the end of the 1800’s, the military started to think larger, and more centrally. At the edge of the every-shrinking Gärdet Military Parade Ground, this Garrison is truly gigantic and is bigger in scale than just about everything in Stockholm, even today. In nearby parts of the city developed during the same era, this Garrison complex would have covered ten city blocks—five blocks long and two blocks deep. The main facade of this building is 350 meters long. While the facades aren’t overly detailed, they do recess and project in a steady rhythm, and this movement between jutting pavilions and receding bays keeps the facade from feeling monotonous. 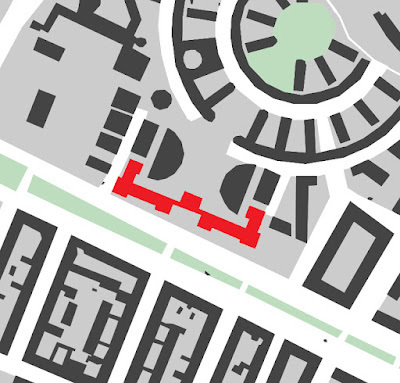 A central alley splits the facade in half and provides access to the maze of courtyards and buildings behind. 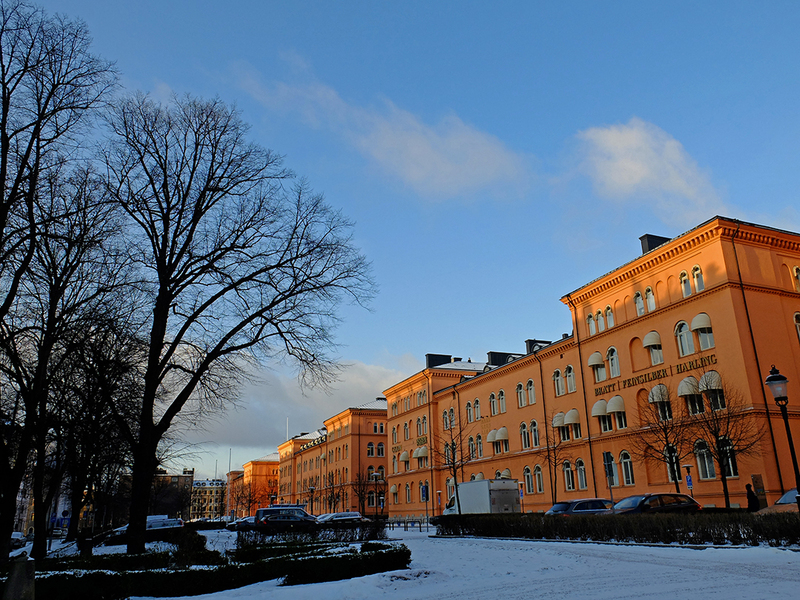 The main facade of the Garrison is a much brighter color than is normal in Stockholm, although it is in the same earthy family as Stockholm’s common ochers and golds. 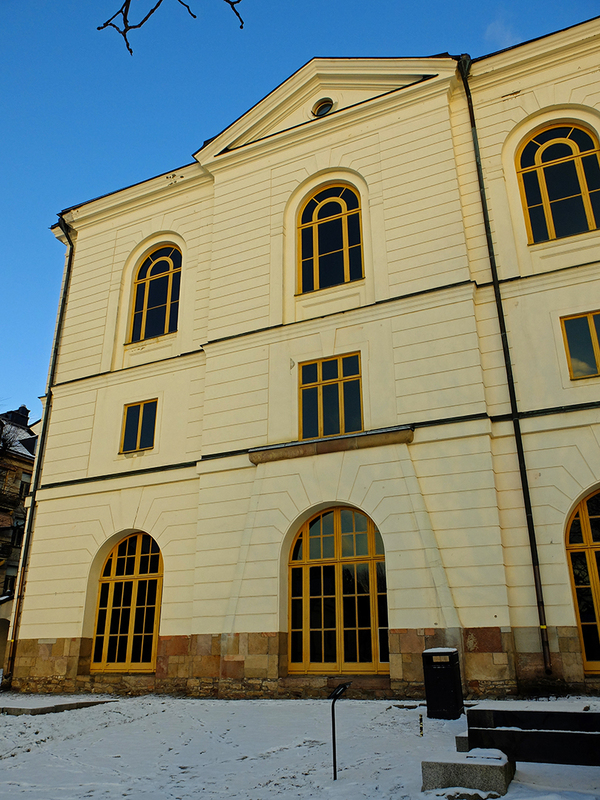 However, all of the courtyard facades are a stark contrast with plain white plaster. 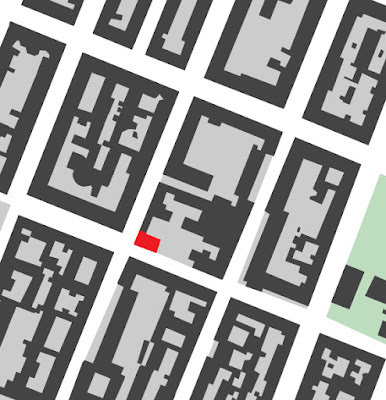 A narrow, linear park with mature trees and a meandering bath separates the Garrison from the street. The military used this complex until 1946 when the military moved from central Stockholm to the edge of the Stockholm region. Half of the complex was demolished to make way for a huge, modern office building, but the remaining half is used as offices for a number of private companies today. 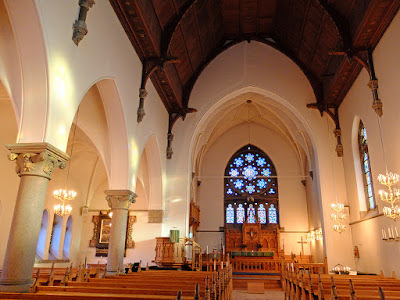 As more and more troops were quartered on the edge of Gärdet, the need for a conveniently located garrison church became more and more acute. Designed in the Neo-Gothic style with its pointed-arch windows and large rosette window, the church, like many of Stockholm’s late nineteenth century buildings, is built of unplastered, exposed brick with light limestone accents. 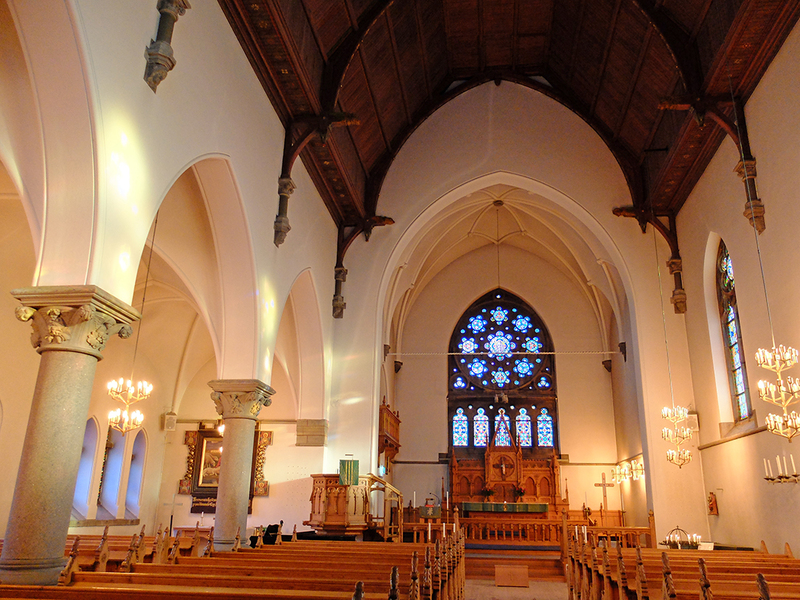 The floor plan is purposefully “charming” in its asymmetry—there is only one side aisle beside the nave. 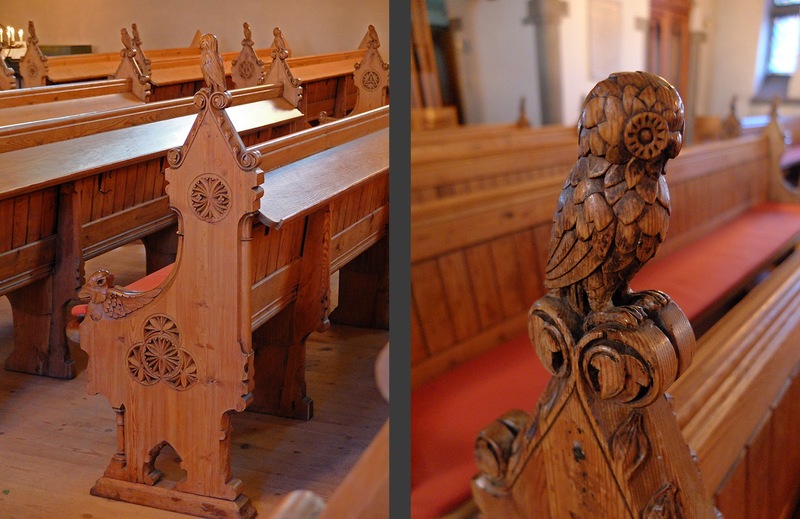 The church was literally built by troops—enlisted men built the structure; the ceiling, pews, pulpit, and alter were constructed carved by the regiment’s carpentry school; and the church’s textiles were woven and embroidered by military wives. The stained glass proclaims the military’s presence with knights, shining armor, and the crescents of various military regiments, and Sweden is also present throughout the building with her symbol of three crowns. The tympanum above the door shows St. George slaying the dragon, also a common symbol for Sweden’s defining military victory when they finally rid the land of the Danes once and for all in the 1500’s. I can’t help but think that the little “castle” tower adjacent to the bell tower is, much like my discovery on the facade of the Artillery Yard (see #6 above), a symbolic artillery shell. 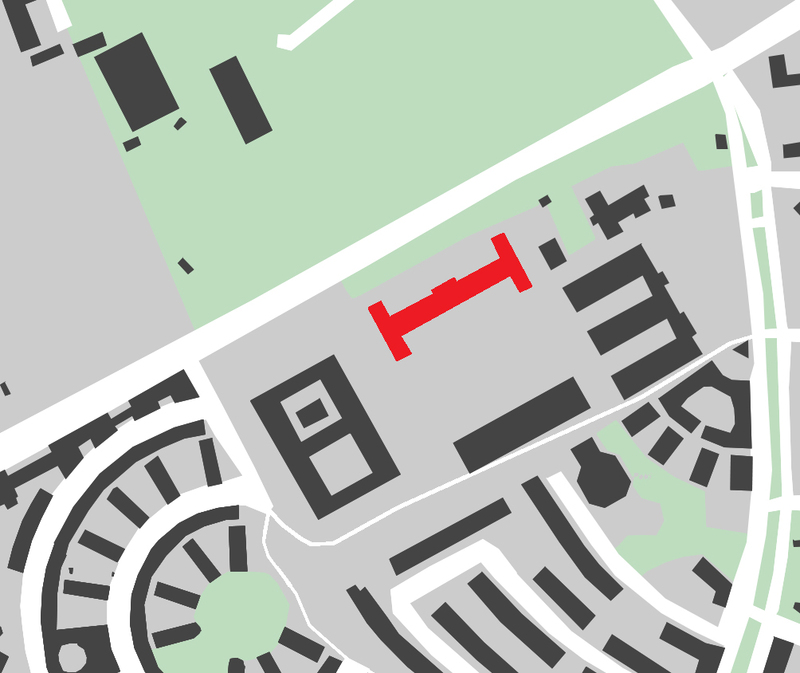 Today, the church sits in the middle of a relatively large and very well used green space. This green space was halved in the 1940’s when the surrounding apartment buildings were built, but the lawns still feel generous and the mature hardwoods still screen off the surrounding city. After the military left the area in the 1940's, the church was bought by the neighboring parish and it is still used as a parish church. 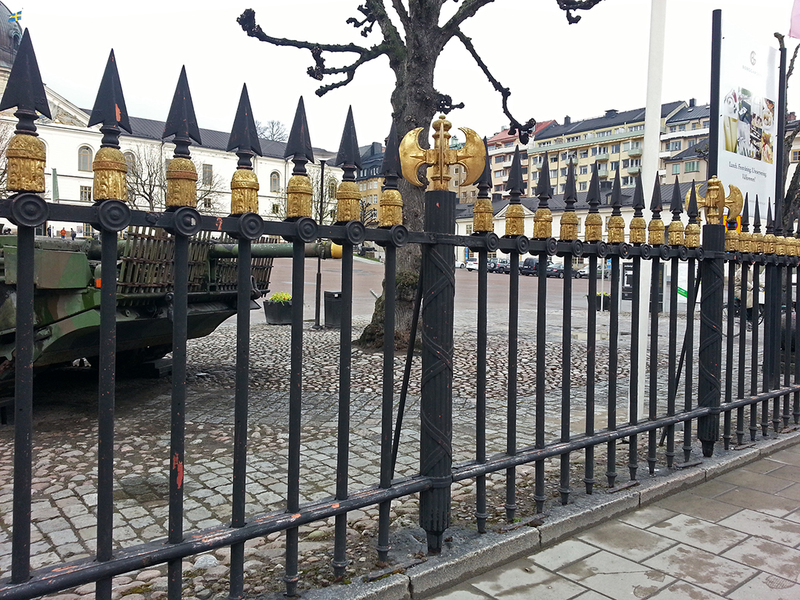 As Östermalm was built up around it, Blom’s Calvary Guard complex (see #13 above) got crowded out--horses need space! A new Calvary Guard complex of 20 buildings was built outside of town, but still on the edge of Gärdet. The main Calvary Guard building is a prime example of the National Romantic style with its massive corner towers which are highly reminiscent of Swedish medieval castle architecture. The portal through the middle tower is not accidentally horse-shoe shaped, and the giant golden crown atop the highest tower claims the building for the crown. 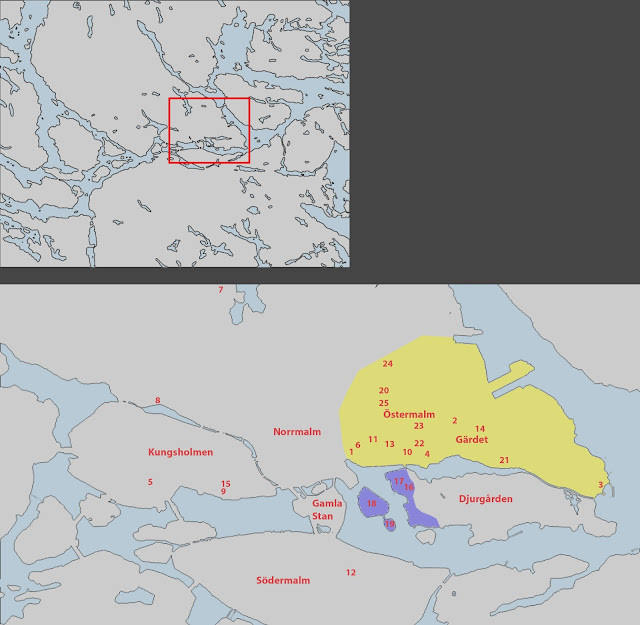 Lackö and Kalmar Castles, both from the 1400's-ish (both images from Wikepedia). The main building contained housing for the regiment as well as mess halls, common spaces, and offices. Other buildings included officer housing, a smithy, a large horse barn, a training arena, etc. Only six of the original buildings are still standing, but the complex is still used by the military and there are still horses in the barns and out in the paddocks today. The public is not admitted into the complex, and there are signs posted that you’re not allowed to take photos, so I could only photograph the main building in haste. 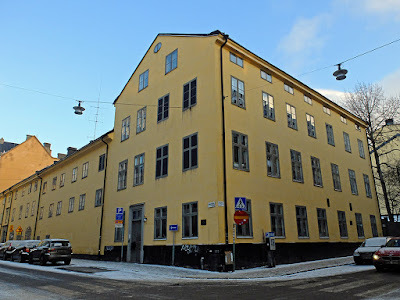 Although this building is technically too recent to be included in this survey of military architecture, I include it because it is stylistically much more similar to Stockholm’s 19th century military buildings than its 20th century military buildings. Another building at the edge of the military exercise grounds Gärdet, this war college is very ornate and is a smörgåsbord of styles—each volume is stylistically different, but the repeated use of the same colors of brick and stone as well as unified bands of watercourses yield a more cohesive impression that you might guess. 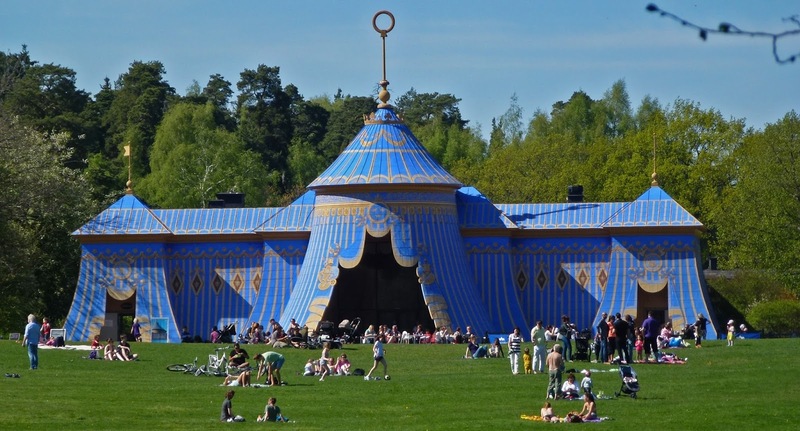 The projecting pavilions are Neo Baroque with long pilasters, plaster ornamentation, and Swedish säteri roofs (broken roofs with a double slope commonly used on palaces and country estate homes in the 1600’s). The corner towers are decidedly National Romantic in flavor and they echo Josephson’s towers at the Calvary Guard (see #24 above). The receding masses between pavilions are French Second Empire with their steep roofs and dormer windows. While visually different, all three of these styles are more modern interpretations of architecture from the distant and romanticized past. This building feels crowded on its site. Continuous wings wrap a central courtyard, but the tight proportions in the courtyard make it feel like the projecting pavilions are looming over you. From the street, the building reads like a dense mass. Symbols for the military and for Sweden are obvious in the building’s plaster ornamentation. 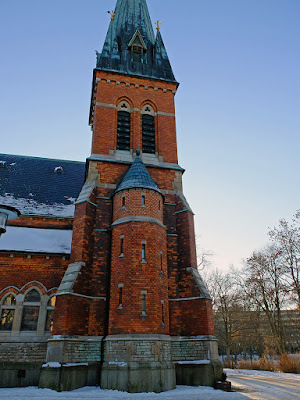 I am a particular fan of this kind of brick finish which was popular during Stockholm’s National Romantic phase—the brick is half plastered over, but you can still read the indentations of every brick. Because it covers over the mortar joints, the plaster gives the brick a more uniform appearance, but the bricks behind the plaster give it texture, scale, and appeal. The building is no longer used as a military college, but it is still used as military offices (as well as for other government agencies and for private companies). 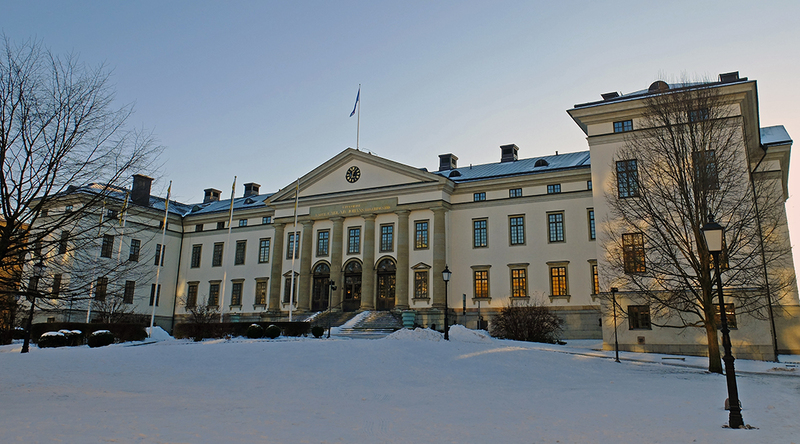 Historically, Stockholm was not only Sweden’s center of government, but the city was also the country’s military center. This seems like a natural and fairly universal development, since the monarchy would have wanted to keep the military close, both to be able to control the military and to benefit from the military’s protection. Washington, D.C. is another example of a city where the government and the military share a common center. Being the military epicenter was a significant part of Stockholm’s identity for centuries, and I have to wonder if a new identity has taken the military’s place. Both the navy and the army were significant and visible presences in central Stockholm until the mid-1900’s— the army moved from Gärdet at the end of the 1940’s and Skeppsholmen was closed as the country’s central naval base in 1953. Both of these areas are significant and welcome gaps in central Stockholm’s urban fabric, and they are both integral parts of Stockhom’s National City Park. 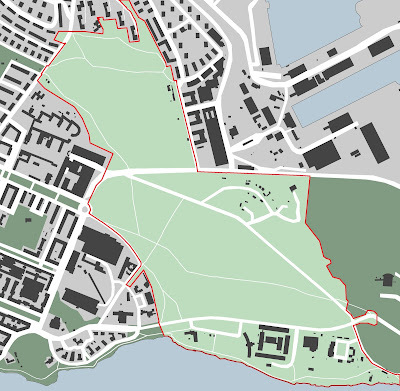 Even buildings that were not a part of the coherent military landscapes of Gärdet and Skeppsholmen such as the Garrison Hospital and the Royal Military Academy at Karlberg Palace are today green interruptions in Stockholm’s city center. 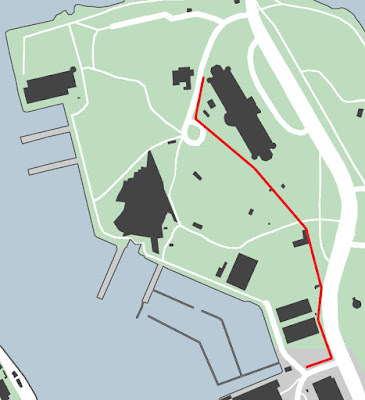 When the army and the navy left downtown Stockholm, they left behind an enormous building stock of high quality buildings. The question of what to do with all of these buildings must have been a huge debate, but the decision to lease them out as office spaces or to use them as large museums seems to have been successful as there don’t seem to be any empty spaces among them. I believe that a big part of the success is that the army seems to have pulled out gradually, one building at a time, as new facilities became ready elsewhere. I’m not sure that street names are meaningful influences on the future of an area, but they do tend to reflect the past. 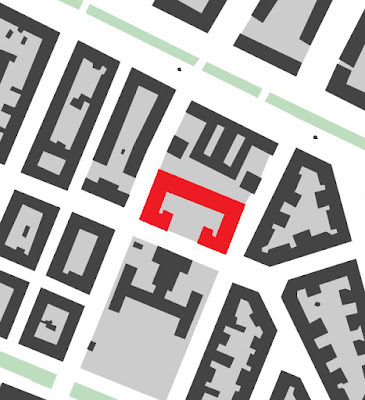 Most of Östermalm was developed in the late 1800’s, and by then the military presence in that part of the city had been established for centuries. Many of the new streets in Östermalm took on military themed names including Commander’s Street, Captain Street, Weapon Street, Shipman Street, Major Street, and Artillery Street. Magnus Andersson, Stockholm’s Annual Rings: A Glimpse into the Development of the City (1998). Johan Rittsel and Johan Engström, Husen i Nationalstadsparken (2005). Ejnar Berg, Vyer från kataler, kastell och Kaserner, Guide över Sveriges militära byggnader (2004). Nils G. Wollin and Inga-Britt Wollin, Skeppsholmen under 300 år Skeppsholmens, Kastellholmens och Galärvarvets bebyggelsehistoria (1971). Ejnar Berg, Erik Josephson och svensk kasernarkitektur (1975).